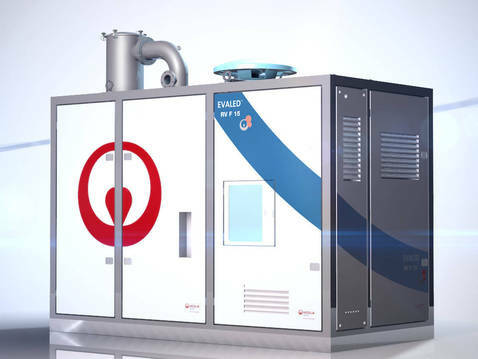 EVALED® RV F is the line of mechanical recompression evaporators designed to reach the highest level of reliability in heat transfer, with minimum impact in terms of fouling and scaling. High efficiency forced circulation shell & tube heat exchanger with horizontal tubes allows wastewater concentration up to the salts solubility limits and to manage also suspended crystals. Wastewater is constantly treated: the distillate and the concentrate are continuously separated and then simply discharged through a pump. Heat is recovered by cooling the two outlet streams using the inlet effluent. Available in different materials to treat different effluents containing dissolved salty, organic compounds and even the most aggressive salted wastewater (high chlorides content), produced by various industries. The MVR is the lowest energy consumption evaporation technology. Our carbon footprint reduction program drives innovation. a lifetime guarantee for the EVALED® evaporators.